Wanjiru is a child with a happy disposition and an infectious smile. She turns 6 on Friday, December 22, 2017. She is an only child in a single parent home. She was a full-term baby born through an elective C-Section. Her birth was normal and her Apgar score was 9/10, then 10/10. Apart from a lot of crying which I attributed to possible colic, she was a typical newborn. Her neonatal pediatrician was happy with her growth and gave her a clean bill of health during all the clinic visits. At 6 months, my aunt who has been a pediatrician for more than 30 years, expressed some concern about Wanjiru’s milestones and suggested I take her for an evaluation. That was the beginning of this difficult journey she has been on. At the evaluation, she was diagnosed as “developmentally delayed” and began occupational therapy immediately. She apparently had poor head control. At 8 months, her new pediatrician ordered an MRI and a Thyroid test. The devastating results from the MRI were that she had “brain damage”. 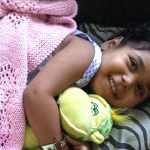 Her diagnosis at the time included developmental delay and cerebral palsy. 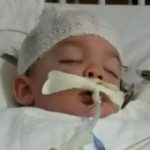 Unfortunately, at 12 months and 3 days old, she had her first seizure which began another series of visits to a neurologist. After almost a year of the seizures not being controlled despite 4 different medications, she ended up at a children’s hospital where tests, including genetic testing, were completed. After she took Phenobarbital, her seizures completely stopped. Attempts to start withdrawing some of the medications in April of this year has led to the return of very mild infrequent seizures. The most recent genetic tests led to a diagnosis of FOXG1, a rare genetic condition that currently has no cure. Wanjiru continues with therapies such as occupational, physical, and speech therapy. Although Wanjiru is currently non-verbal (she’s begun to repeat some words at speech) and does not walk, I believe God will heal her completely. I am doing my part and I see Sara’s Garden as an opportunity to see this process continue. I heard about Sara’s Garden through a friend’s sister. She and her husband have a 9-year-old daughter with cerebral palsy (whom I have met) who received HBOT and conductive education. I believe the treatments and services at Sara’s Garden will give Wanjiru the ability to walk and talk and allow her the opportunity to be everything she was created to be. With your help, a contribution directly to Sara’s Garden for Wanjiru’s will help make this happen. Sara’s Garden offers Hyperbaric Oxygen Therapy (HBOT). Unfortunately, in the United States insurance will often not reimburse for HBOT treatments for seizures, Cerebral Palsy or FOXG1, even though there is an acknowledgment that it may be therapeutic. That is why we could really use your help. HBOT is only $100.00 per treatment hour (as opposed to $1,500-2,500 per treatment at a hospital.) However, since the plan is for Wanjiru to receive at least 40 HBOT treatments and take part in Conductive Education, the costs add up quickly. If you could assist us with the cost (or even just part of the cost) of a single $100 HBOT treatment or part of the cost of Conductive Education, it would help reduce our overall expenses greatly. 100% of the funds received go into an account in Wanjiru’s name and will be used for her treatments and services. Any contribution made would be considered a tax-deductible donation as Sara’s Garden is a 501(c)(3) non-profit facility. Checks can be made out to Sara’s Garden with Wanjiru Kimondo written on a sheet of paper accompanying the check. Please do NOT write her name directly on the check. You can also donate online via credit card by clicking the link below. Thank you for considering to help us with the treatments and services that could be essential to Wanjiru’s future!